Can easing sanctions spur democracy? 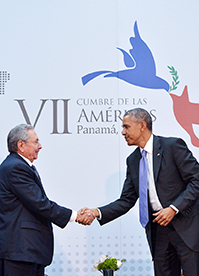 President Obama is opening a new chapter in the long and turbulent history of U.S. relations with Cuba. In December he announced plans to ease U.S. trade and travel restrictions and proposed re-establishing full diplomatic relations with Cuba. Then, in April, he met with Cuban President Raúl Castro. With those moves, Obama cast aside five decades of U.S. policy designed to isolate the island nation, a communist state since shortly after Raúl's brother, Fidel, seized power in a 1959 revolution and made common cause with the Soviet Union. Cuba has welcomed Obama's new policy, but cautiously, expressing doubts, for instance, about giving U.S. diplomats free rein on the island. American supporters of Obama's actions argue that trade and other sanctions have failed to motivate Cuba to abandon its communist ideology and improve its human rights record. But critics say Obama is giving up leverage that he could have used to force political and economic change at a time when Cuba faces new economic uncertainties.